I have the luxury of enjoying the food from the cafeteria at work because I work in the nutrition department. It’s a definite perk. Most days I bring my own breakfast because I’m an oatmeal snob but I usually get lunch! In order to feel satisfied my lunch must have protein, a grain, and all the vegetables. Chickpea stew with chicken and roasted Brussels sprouts. My usual salad topped with chicken, quinoa, and roasted vegetables. Hummus and roasted vegetable wrap with chicken. 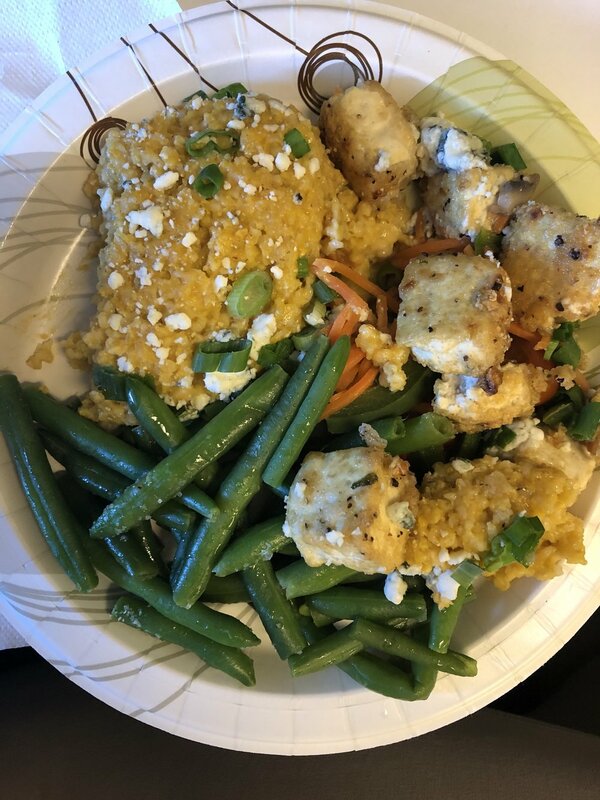 My savory oatmeal with quinoa, roasted vegetables and green beans. Spinach, roasted sweet potatoes, cauliflower, and pork. Eating lunch at work saves me time and should save me more money but I enjoy food too much and grocery shop all too frequently. Nonetheless it’s delicious and truly a treat. I also can tell my patients that I eat the same food as them.